Sara has been practicing law since 2006. 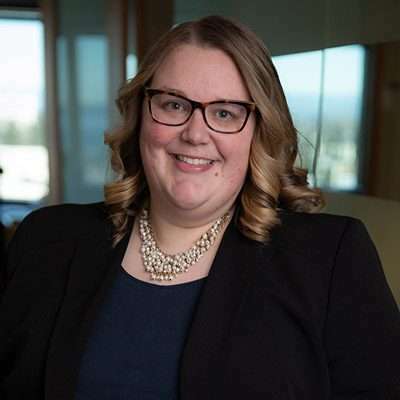 She joined Anderson Hunter as an associate in 2018. Her primary practice areas include Estate, Trust and Guardianship Administration. She was born and raised in California and moved to Seattle to attend Seattle University School of Law. She began her legal career as a Family Law and Guardianship Facilitator with the King County Superior Court, where she assisted self-represented parties in all areas of family, guardianship and probate law. In the years since leaving the King County Superior Court, Sara has focused her practice on the representation of fiduciaries and individuals with the establishment and ongoing management of Probates Estates, Trusts and Guardianships. When not practicing law, Sara enjoys spending time with her husband Tom and their cats Martha, George and Socks. Sara is enthusiastic about animal rescue and is on the Board of Directors for the Seattle Area Feline Rescue in Shoreline.